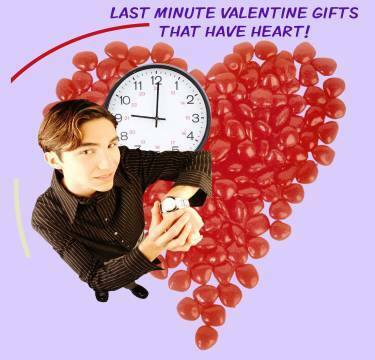 Last Minute Valentine Gifts That Will Make Your Sweetheart Smile! You know that Valentine's Day is a wonderful occasion to show your happiness that this person is in your life. And you want to give a gift that will be meaningful - that shows you have given the present some thought. But you have no time or energy to run around looking for the perfect offering, even if there is such a thing. Here are my own solutions and a few suggestions that I hope will help you...I've been a singer and vocal coach for many years. And I can't tell you the number of times that people have taken me aside after a concert or upon hearing that I teach - to tell me in "real confidence" that they have "always wanted to sing, but I could never get up the nerve." Or - "I dreamed of painting when I was a kid, but my father said, 'No way!'" Or, - "I'm really a writer, but no one else knows about it." So when I look for last minute valentine gifts that are easy to manage, I think about the Creative Arts! Ask yourself, what kind of artistic "thing" would s/he like to pursue?
. Over the years, the book has received remarkable reviews. BUT, I DON'T HAVE THE BOOK! inspired one of my voice students to bring his long-held desire to paint - to fruition. He said the book was "life-changing!" YOU SEE? THIS IS PRETTY EASY! Just use your imagination about what will please your "Valentine." No need to have it in hand. Instead, tell her about it. Show it to him in a card. 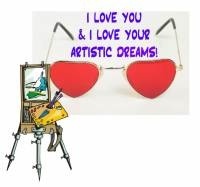 Show how much you care about his deepest artistic desires... Now that is a gift with heart! 3. But if you know that your loved one would really like to sing, then consider giving him 3 lessons to find out if he's got both the desire and the talent. Give him a card that says HERE'S YOUR LITTLE PUSH - NOW SING!!! I hope these last minute Valentine gifts ideas help you to have a very Happy & Creative Valentine's Day!